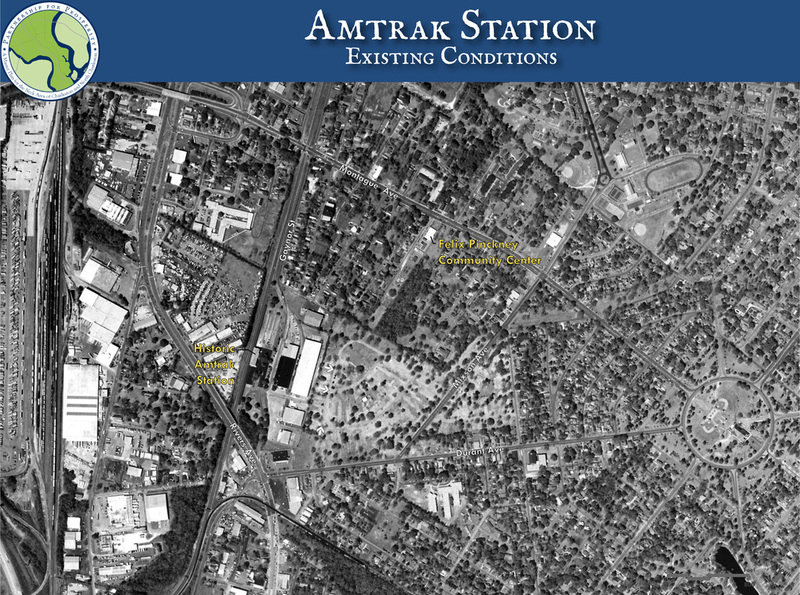 The Amtrak Station catalyst area is a neighborhood center. Located off Rivers Avenue just north of Durant Avenue, this area is bordered to the north by the Liberty Hill LAMC neighborhood, which is part of LAMC; to the east by the Mixson development, a new New Urbanist development planned to include residential units, shops, and civic spaces; and to the west by CSX railroad tracks used by Amtrak’s Silver Meteor service. The historic train station and adjacent parking areas anchor the area, which also includes light industrial, commercial, and civic uses. Gaynor Street connects the catalyst area to Montague Avenue on the north and Rivers Avenue and Durant Avenue on the south. 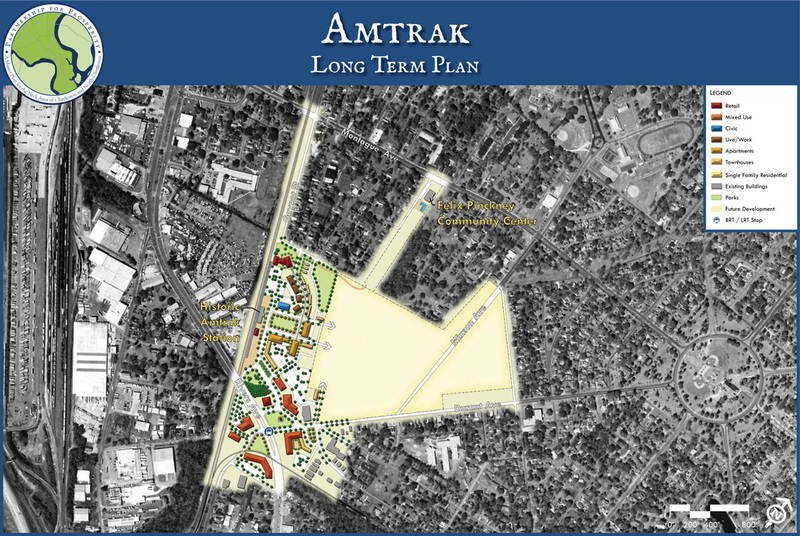 With the upcoming planned relocation of Amtrak service to the a new Intermodal Station, preservation of the existing historic train station site can serve as a catalyst opportunity. The structure itself can be renovated to provide much needed community meeting space, as well as office space to be used as a business incubators. The outside areas, now used for parking and loading, can be converted to green spaces that can be utilized used for community events and recreation, helping integrate this area into the fabric of the Liberty Hill neighborhood and reduce high speed cut-through traffic. The site would continue under ownership by CSX, and would be leased for its new purposes with separation from the rail tracks, which will remain active for freight traffic. 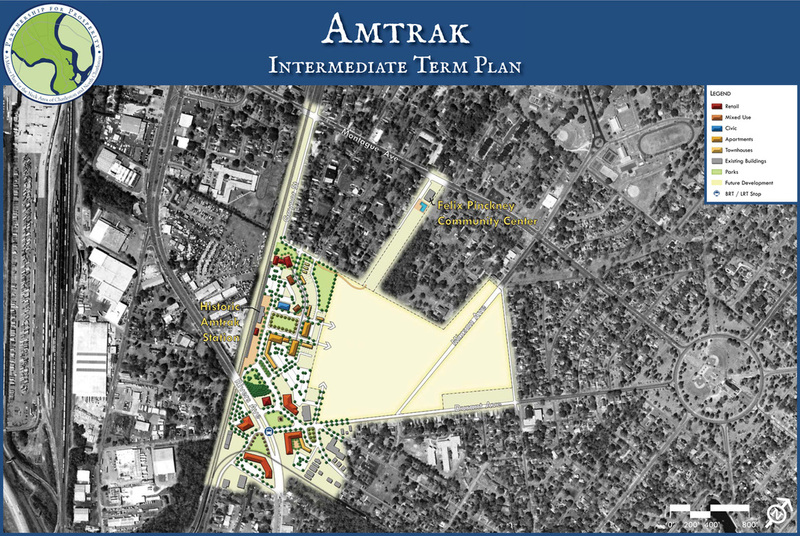 There has been some discussion about moving the proposed Intermodal Station from its current location near the Dorchester Road/Montague Avenue intersection to the existing Amtrak station site. In the event this happens, it clearly becomes the catalyst that drives redevelopment of this area. The mix of non-residential uses shifts from neighborhood—oriented to community-oriented that provides the retail services and amenities needed by commuters and travelers. The look and feel of the Rivers Avenue/Durant Avenue intersection and adjacent area changes since the catalyst area is now a regional gateway instead of a neighborhood center and roadway modifications may be needed to accommodate the expanded variety of transportation services that will be accessing the area. Existing neighborhood uses would need to be buffered from the impacts of the additional vehicular activities. Building sizes in this catalyst area should be low-rise (1-3 stories) to complement the historic Amtrak station, not overpower it. This should also complement the adjacent Mixson development. However, due to the difference in elevation between Gaynor Street and Rivers Avenue, some mid-rise buildings (3-5 stories) may be needed to provide visibility and focal points. Rivers Avenue provides accessibility to the rest of the Neck area and points beyond through enhanced bus service, while improvements in local connectivity enhance the circulation between the catalyst area and the neighborhoods that surround it. The history and potential prominence of this area as a rail gateway to the Neck area can be an anchor for redevelopment. The preliminary planning level program derived from the Long Term Phasing Concept Plan shows that about 400 residential dwelling units and 50,000 square feet of non-residential uses could be developed in this catalyst area. Given the multi-million dollar funding shortfall in CARTA’s plan to relocate the Amtrak station to the planned Intermodal Center on West Montague Avenue, it is possible that the Amtrak facility could remain and be incorporated as part of an Intermodal Center at this location, creating a more attractive use within the community while retaining and exhibiting its historic character and significance. In order for the catalyst area plan to accommodate the Intermodal Center, several adjustments would be needed that differ from the long term phasing plan.